The wireless Easyclick ceiling-mounted movement detector is supplied with energy from solar cells and detects movements via a 360° passive infrared sensor. The movement detector is easy to install and saves energy. For instance, lighting switches ON automatically when a person enters a room, and automatically OFF after a follow-up time when he leaves again. In this process, the movement detector transmits radio signals to the parameterisable Easyclick receivers or all EnOcean interfaces for the building management systems. Battery operation (CR2032) is possible when the ambient brightness falls below 50 lux. Detection range: approx 12 m dia. Suitable receivers: all Easyclickpro receivers. 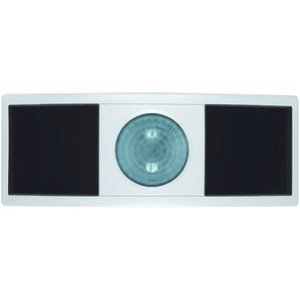 A separate light sensor can be installed for lighting control based on daylight exposure.